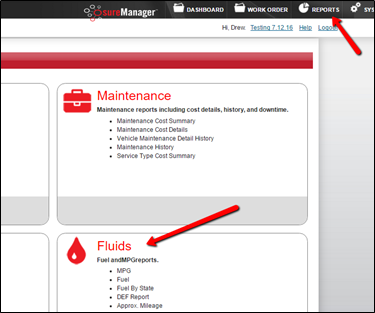 To run reports on your Internal Fuel Tanks, follow these simple steps. Go to Reports and then click on Fluids. To run a report on fueling events, scroll down to Fuel Tank Exceptions and use the drop down arrows to select the criteria and enter the dates you want to run. 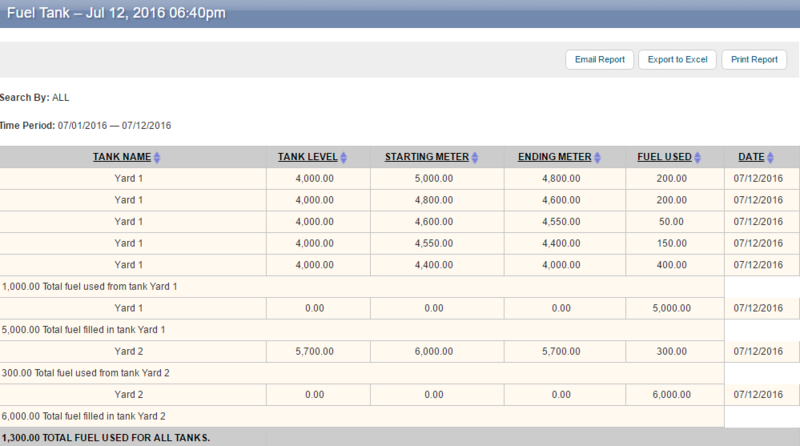 To run a report that includes Gallons Used and/or Bulk Purchases, scroll down to Fuel Tank and use the drop down arrow to select the criteria. There will be a checkbox next to this field labeled Refill of fuel. Check this box to include Bulk Purchases. You will not see this check box if you have not entered a Bulk Purchase into your account yet. To run a report that included Date, Vehicle, Tank, Odometer Reading of Vehicle, and Gallons, scroll down to Complete Fuel Tank and use the drop down arrow to select the criteria and enter the dates you want to run.